The cassava is widely consumed in the three peruvian natural regions: coast, mountains (Andes) and jungle (Amazonic forest). It’s the third largest source of carbohydrates for human food in the world and it’s used in ethnomedicine to threat diarrhea, malaria, hypertension, headaches and even the irritable bowel syndrome. Being so good, it was eaten by the Incas in a lot of dishes. But for now, we’ll enjoy it in this recipe that will be useful as an entrée for 5-6 people. Peel the cassava, cut in medium pieces and put in a pot covered by water. Boil and cook until it gets soft and tender. Strain. Add the butter, the parmesan cheese and the yolks. Knead until get a soft puree; mix well: the puree must be thick. Take a portion in your hands a make a little ball. 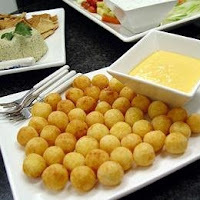 You can put in the center of each ball a piece of mozzarella cheese. Pass the cassava balls by flour and refrigerate for a couple of hours. Heat oil in a frying pan. When the oil is hot, fry the cassava balls. The oil must be always hot to get the balls browned without melting the cheese inside. You can serve with the Huancayo-style cream, used in the papas a la huancaina. Optional: Before frying the cassava balls, when you get the puree, you can add yellow chili/pepper in paste. When you’re stuffing with cheese, you can put a little piece of basil too. You’ll get, more or less, 30 cassava balls. Cassaballs also can be called as combro or templek in my area.